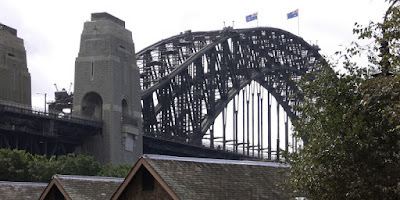 This is a shot of the Harbor Bridge from an area known as The Rocks. It’s a little “trendy” area that has many small shops and restaurants and “hotels” which are bars. Yesterday there was a market area set up where vendors had booths selling all kinds of arts and crafts stuff. Despite the rain there seemed to be quite a few people out. 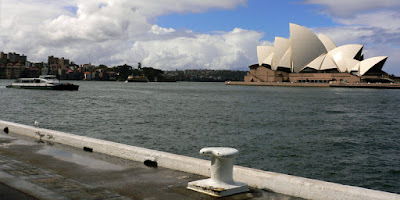 Of course this is the Sydney Opera House looking across Circular Quay. The boat in the picture is a Rivercat. 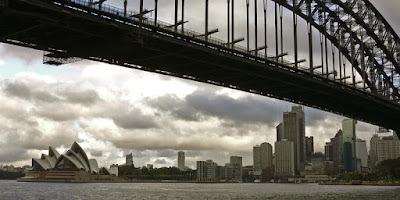 I’ve been taking the ferry, Rivercat, into Sydney from Parramatta. The Rivercat is the most fun way to get to this area. I could take a train but the scenery is better taking the ferry. Here’s one more picture of Sydney. We were on our way to the Sydney Aquarium at Darling Harbor. 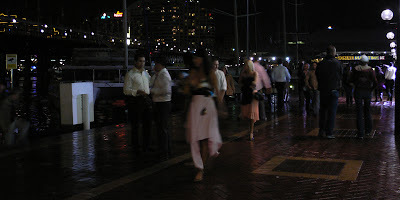 There are quite a few restaurants and bars in the Darling Harbor area and is quite popular with the partying crowd on the weekends. Here’s some of the partying crowd, mostly young people in their 20’s.